Mrs. Krishna Lal, Consultant, IGNCA (M.A (History), Aligarh University) served in the Decorative Arts and Textiles Department, National Museum, New Delhi for 34 years. She was awarded with a French Government scholarship to pursue a Diploma in Museography in French in 1971-72. Under cultural Exchange programmes, she had explored most of the museums of French and then U.S.S.R.
Mrs. Lal Participated and presented papers in several seminars and international conferences held in U.K., Mexico and Greece. In addition to coordination of several national and international exhibitions, she was an active participant in the Festival of India Exhibition in U.K., French and the U.S.S.R. during 1982-1988. 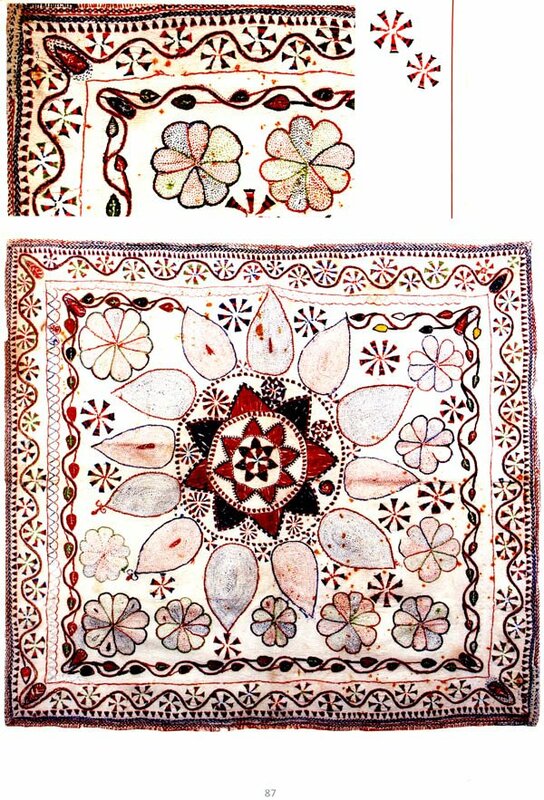 Her literary/ research work includes a Catalogues on “Bidriware in the National Museum collection, New Delhi” (1990), “Indian Decorative Arts” published in German (1985) and Russian (1978) language, Phulkari: from the realm of women’s creativity (2013). Her ‘Peacock in Indian Art Thought and Literature was published in 2006. She also co-authored two books titled “Tourism, Museums and Monuments in India” (1974) and Cultural Tourism in India” (2003). 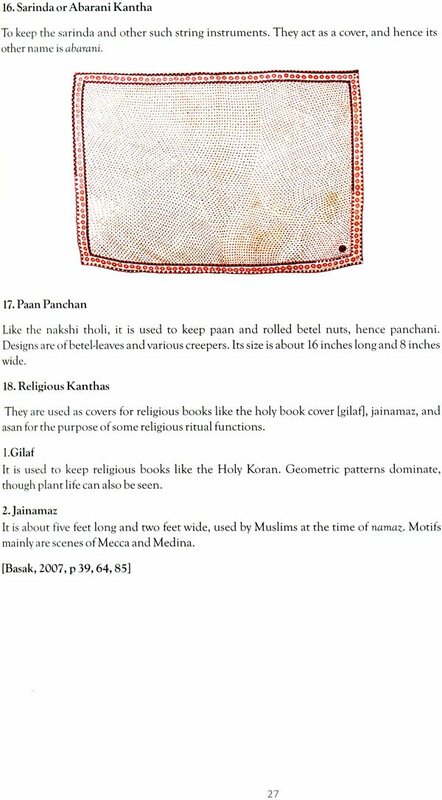 She has also contributed a chapter on “Indian Decorative Arts” in Masterpices of National Museum in 1985. Her book “Cosmetics and its impact on Indian Art” is in press. After retiring from National Museum in 1994, she joined the Indira Gandhi National Centre for the Arts, as an adviser for documentation and cataloguing of the art objects of the Cultural Archives of the Centre and worked there for five years. She has also completed a research project assigned by Ministry of Culture, Government of India. The Indira Gandhi National Centre for the Arts (IGNCA), was established in the memory of Late Smt. Indira Gandhi and is visualized as a centre encompassing the study and experience of all the arts. Each form with its own integrity yet within a dimension of mutual interdependence interrelated with nature, social structure and cosmology. The Janapada Sampada Division of the IGNCA undertakes research of the Indian cultural phenomenon in its totality and builds core collection of material and documentation on folk and tribal arts through multi disciplinary approach. 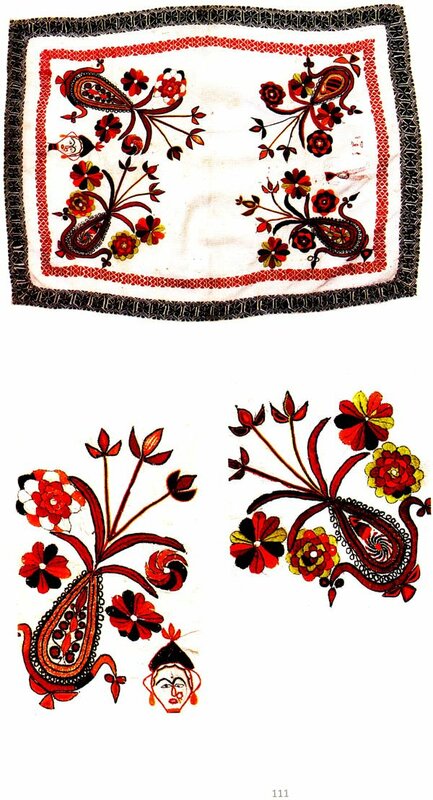 One of the major programmes of the Division is Ethnographic Collection under which creativity at different levels is explore, researched and documented. A core collection has been built the include textiles, masks, puppets, ritual objects from all over the country. 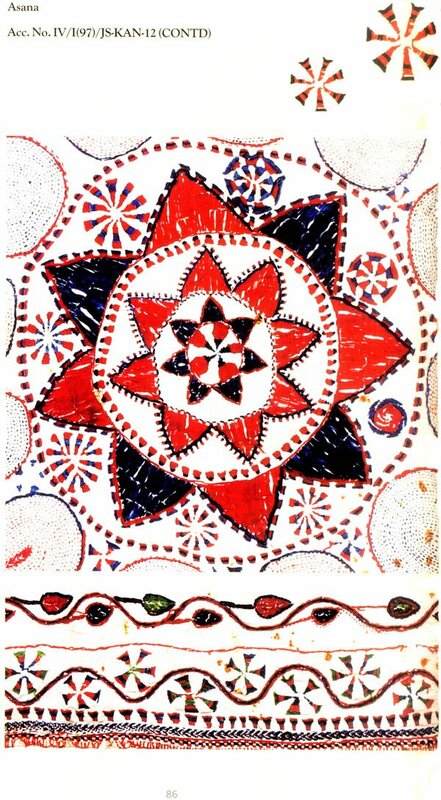 kantha embroidery pieces are one of the constituent of this collection. 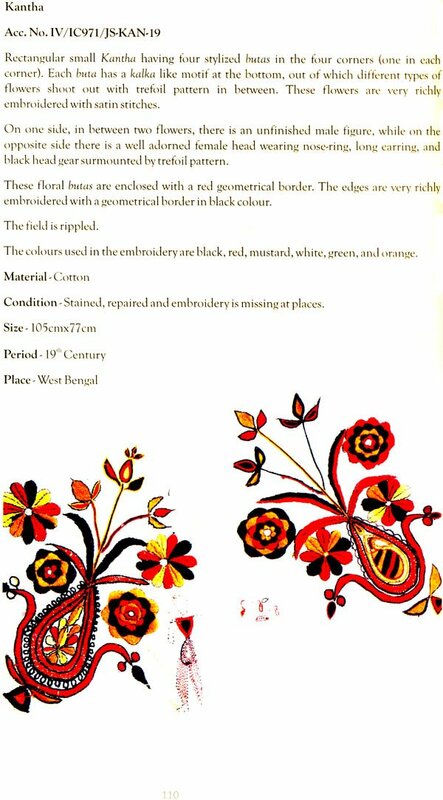 kantha – the embroidered poetry on cloth – speaks volumes about the imagination of Bengali women and the aspiration that her craftwork reflects. 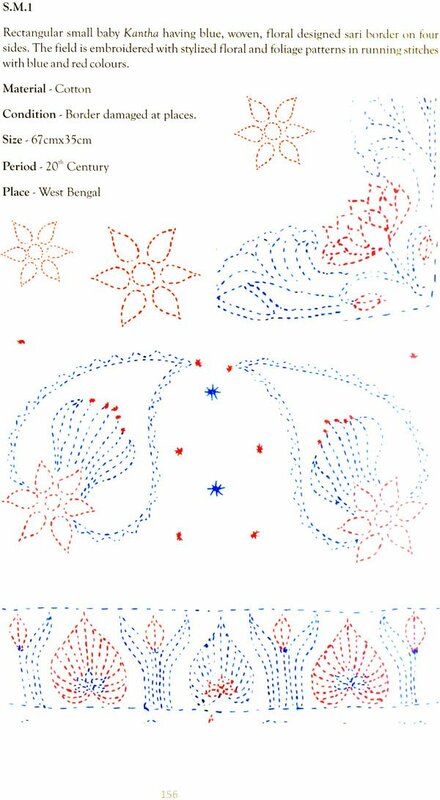 It is a well-conceived art work, which has always attracted people from all walks of life. She creates the most amazing kanthas with great love and affection for her dear ones. Her creativity stands unmatched when she breathes life into a discarded saree, worn out from constant use and laundering. She transforms this simple five metres of old cloth into a most admirable, attractive and unparalled utilitarian artifact. 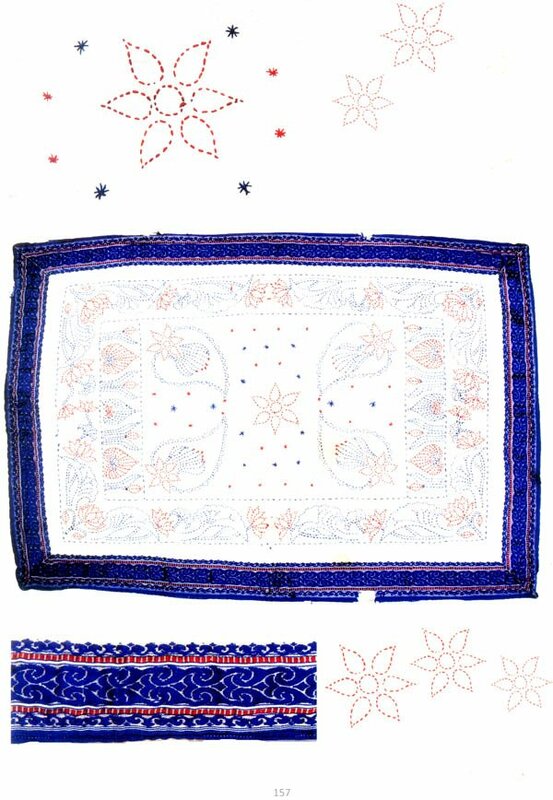 Initially, light coverlets or quilts to withstand the mild winters and cool monsoon nights of Bengal were made using the kantha embroideries, which was limited to simple stitches and a few colours. 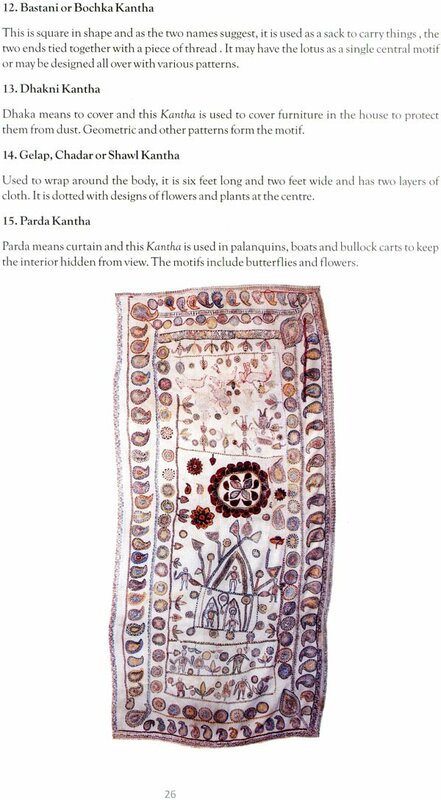 Some kanthas were used as swaddling clothes for babies: expectant mothers spent their last stages of pregnancy in making a kantha for the new born, with the new born, with the belief that this piece of cloth would bring good fortune for the family and protect the baby from disease. Every home in a Bengali village housed a number of kanthas that were more for personaluse than commercial gain.